Knowing how to clean washing machines is an essential part of home maintenance that will protect your appliance as well as your clothes. If you’ve been dealing with odors coming from your washing machine, these steps will help you, too. 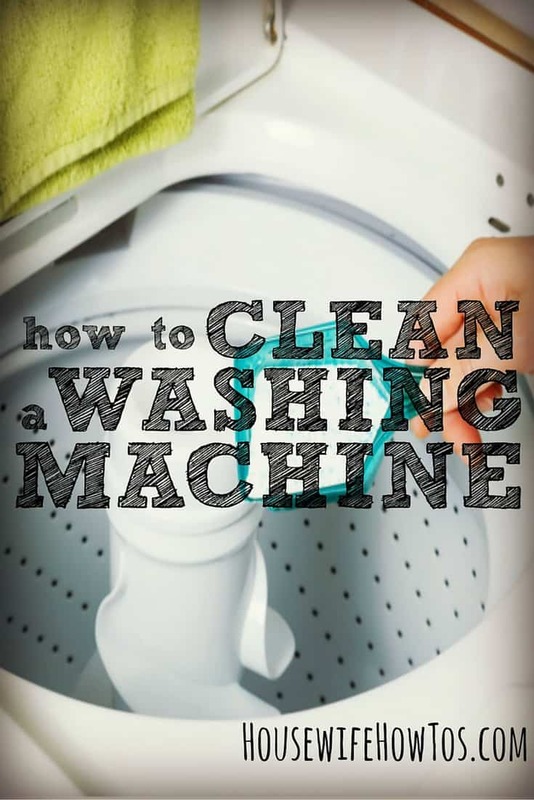 Doesn’t it seem like a machine that’s regularly filled with hot, soapy water ought to clean itself in the process? Unfortunately, nothing could be further from the truth, especially if you have a high-efficiency washing machine that’s prone to odor and mildew. Open the lid and spray it, then use a soft brush to remove any caked-on detergent or grime. Be sure to get the hinges, too. Using a microfiber cloth dipped in hot water, or a Magic Eraser, go around the hard rubber gasket at the top of the barrel. Scrub until you’ve removed any build-up then wipe down with a clean, wet cloth. Remove the bleach/fabric softener dispensers, if any, and wash them in the sink using hot water and a soft-bristled brush. Dry well, and return to the machine. Run the wash cycle on the hottest water setting and add 2 cups of white vinegar as the tub fills. Allow the cycle to run through its entirety, including rinse, to clean and disinfect the interior. While the wash cycle runs, wipe the surface with a dry microfiber cloth to remove any lint. Spray the machine with homemade all-purpose cleaner and wipe it down. If you are physically able to do so, pull the machine out from the wall so you can clean its back and sides, too. This is also a good time to mop the floor beneath the machine. Use a soft-bristled brush and soapy water to clean the rubber gaskets around the door. Wipe with a clean, damp cloth and dry well. If yours has a cleaning cycle, use it. Fill the soap dispenser with white vinegar first and allow the cycle to run to completion. If yours does not have a cleaning cycle, add 2 cups white vinegar to the wash cycle and allow it to run through completion. Clean the inside and outside of the window with a wet microfiber cloth. Wipe the drum and window completely dry with a microfiber cloth or small towel. Spray the machine with homemade all-purpose cleaner and wipe it clean. If you are physically able to do so, pull the machine out from the wall so you can wipe its back and sides, too. Mop the floor beneath the machine to remove any detergent or fabric softener spills. 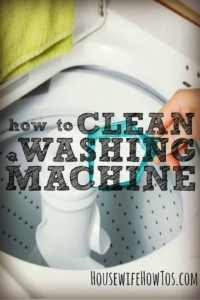 • Clean your washing machine monthly. • To eliminate odors between cleanings, leave the door open after each wash cycle until the tub has thoroughly dried. 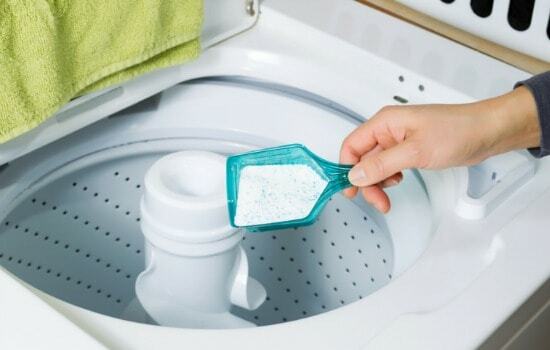 • Never use more soap than called for by your machine’s manufacturer or you’ll cause buildup that will lead to odors., and add vinegar to your rinse cycle in place of fabric softener to keep your clothes static-free while preventing residue build-up in the tub. • Add vinegar to your rinse cycle in place of fabric softener to keep your clothes static-free while keeping the machine’s tub cleaner. • Inspect your washing machine’s hoses for signs of wear or deterioration and replace them every five years. If your hoses are rubber, it’s a good idea to swap them immediately for new stainless steel ones which are less likely to burst. • At least once a year, clean your clothes dryer, too. It will dry your clothes faster and is an important way to prevent one of the leading causes of residential fires. If you found this helpful, please Pin it. I was wondering if when you use vinegar instead of fabric softener, you’re clothes end up smelling like vinegar? No, the vinegar smell disappears in the rinse and definitely is gone by the time they’re dry. How do I clean my dryer inside from pen or marker exploding? Oh heavens, NO! Malt vinegar is best on fish and chips, Shabana! I suspect you’re probably more familiar with the phrase “purified vinegar”. Malt vinegar contains barley, and is a lovely source of flavour, but is not suitable for cleaning. I’m glad you have everything on hand. Good luck, and let me know how it turns out! Thank you for this…I have been looking at my gunky top loader every day for a week knowing something must be done but not knowing where to start. No excuse now!